Prior to his ALS diagnosis, Eric was a mechanical engineer for 30 years and very physically active. He was an avid runner and biker, completing a marathon and more than fifteen 150-mile rides for the MS Society. Eric first noticed something wasn’t right when he started having trouble speaking. After many doctor visits and much internet research, Eric suspected that he had MS. However, when he began having trouble forming words, swallowing, and then eventually experienced weakness in his left leg, Eric’s research led him and his family to suspect he had a much worse diagnosis than MS: ALS. Eric had never heard of ALS prior to his research, but he knew of it by its other name, Lou Gehrig’s disease. Eric could no longer do most of the cooking and grocery shopping for the family as he had, so his wife, Amy, had to take on these roles, in addition to being his main caregiver. Although she was unaccustomed to accepting help from others, Amy is now thankful for the support from her friends and family who cook meals for her family twice a week. A family member took responsibility for finding Eric a second hand van, fully equipped to support the needs of someone with ALS. With this newfound freedom, Eric went to his daughter’s Lacrosse games throughout her senior year of high school. Eric was hospitalized in late 2013 from blood clots in legs that traveled to his lungs, and then again for a respiratory infection. 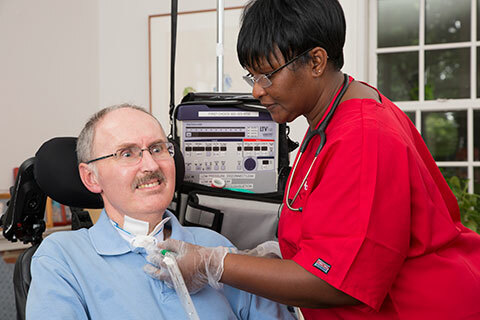 As the situation rapidly worsened, Eric and Amy chose invasive assistive breathing technology to reduce the probability of future lung infections. He came home with a trach and ventilator to help him receive deeper breaths, remove secretions, and to give him a rest from breathing as needed. 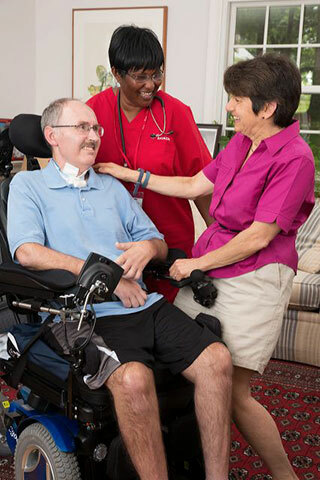 Eric began receiving in-home nursing services from BAYADA when he returned after the second hospital stay. Amy felt a great sense of relief as soon as Eric began receiving services from BAYADA. Caring for him was too much for one person to do on their own at that stage of his illness. Amy shared, “I could not have done it without BAYADA.” Although it took a while to adjust to the changes necessary to provide for Eric’s care, she said it was exactly what their family needed. They renovated a downstairs office and powder room into a bedroom and accessible bathroom, and added an outdoor deck so that Eric could be outdoors and enjoy their backyard. To help with Eric’s care, Amy decreased her work responsibilities by transferring into a new role and going on partial family medical leave. Eric’s illness has been hard on his family, but they have accepted his diagnosis and remain positive. Humor and Eric’s relentless smile and positive attitude help them cope. Eric’s CM Sharon Carney (NSS) shared, “Amy has unending energy, and if she wants it to happen, she makes it happen for him.” Both Amy and Eric are proud of their teenage daughters who have learned valuable life lessons about love and caring for others by caring for their father in his time of need. They remember their dad reading to them before bed when they were little, and now it’s their turn to comfort him, often reading to their father when he is going to sleep.